Is there anything better than a relaxing spa day? Every once in awhile, I like to spend an entire day relaxing at home, using my favorite beauty products, mixing up DIY masks, and feeling rejuvenated. As a way of spring cleaning your body, try this spring spa day routine! Begin your spa day with a restorative yoga session at home. You can choose your own poses or try a routine like this one from Yoga with Adriene. This will help to set your intention for the day and massage the internal organs. After yoga, cleanse your face with a gentle cleanser like Fresh's Soy Cleanser or Caudalie's Gentle Cleansing Milk. Consider using a konjac root sponge or your favorite handheld cleansing device to gently exfoliate your skin. Then, create a facial steam by adding a few drops of essential oil and fresh herbs to a bowl of boiled water. Cover your head with a clean towel and let your face hover safely above the water in the steam for up to five minutes. After steaming, apply a face mask that utilizes fresh ingredients like rose, cucumber, honey, and lavender. I suggest Sisley's Black Rose Cream Mask or the Peter Thomas Roth Cucumber Gel Mask. Or, you can make a mask at home. See below for a recipe! While your mask is on, draw a warm bath and use a good body scrub. 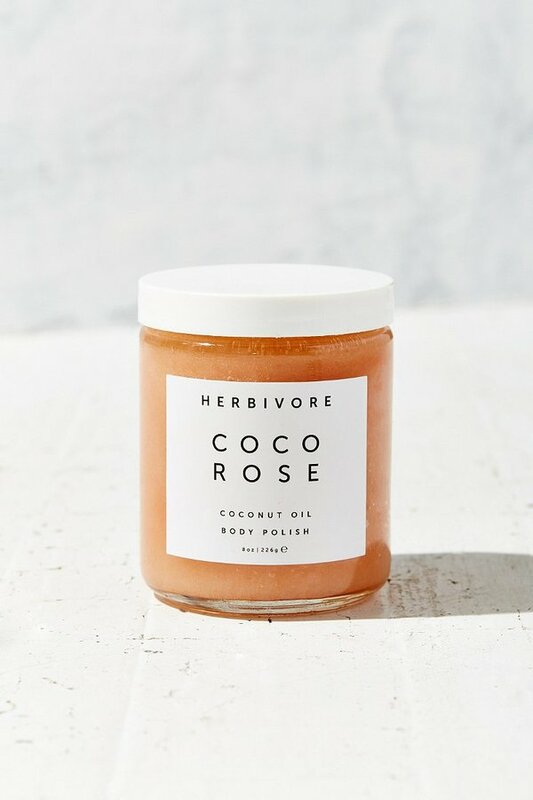 I suggest something like Herbviore's Coco Rose scrub or Kopari's Coconut Crush Scrub. You can also make a great, inexpensive scrub at home using sugar and your choice of add-ins. While the bath is filling, apply a mask to your hair. This can vary based on your specific hair concerns but I like a nice oil or the lemon cleansing mask from Christophe Robin. Leave this hair mask on while you soak. Once the bath has filled, add your favorite bath soak. This can be anything from a rose petal salt soak to Herbivore's Coconut Milk Bath Soak or Fig + Yarrow's Mustard Soak. Chill in the bath for as long as you're comfortable then rinse your face and hair and get into a comfy robe. Apply your favorite hand cream and once your skin is dry, apply a fresh coat of polish to your fingernails and toenails. Try a pretty spring color like mint, blush pink, or even a soft lavender. Finally, wrap up your spa day with aromatherapy and meditation. You can use an essential oil diffuser or make an essential oil room spray to spritz your sheets. Use your favorite meditation app to choose a guided meditation of any length you desire. Blend together coconut oil and rosewater, then pour over sugar. Mix well, then use as a body scrub in the shower. Be sure to rinse well. Use blender to mix ingredients into a paste. Apply to hair for about 10 minutes, then rinse. Blend all ingredients in a blender until smooth then poor through a sieve to remove any chunks. Apply to face with a cotton round.